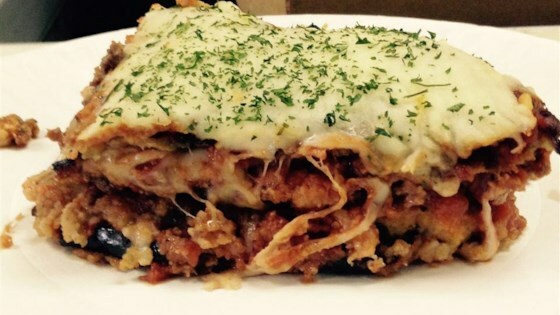 "It is a delicious lasagna using eggplant instead of pasta." Preheat oven to 375 degrees F (190 degrees C). Oil 2 baking sheets and a 9x13-inch baking dish with 1 teaspoon olive oil. Whisk eggs and water together in a shallow dish. Combine Parmesan cheese, bread crumbs, salt, and ground black pepper in a separate shallow dish. Dip eggplant slices into egg mixture, then press each gently into bread crumb mixture. Gently tap off any excess crumbs. Arrange slices on the prepared baking sheets. Bake eggplant slices in the preheated oven until tops are golden brown, 20 to 25 minutes. Flip eggplant and bake an additional 20 to 25 minutes. Remove eggplant from the oven and increase temperature to 400 degrees F (200 degrees C). Heat 2 tablespoons olive oil in a skillet over medium-high heat and stir in ground beef. Season beef with salt and ground black pepper. Cook and stir until beef is browned and crumbly, about 10 minutes. Drain excess grease. Stir tomato sauce into ground beef; bring to a simmer and set sauce aside. Place 1/3 of the eggplant slices on bottom of the dish. Pour 1/3 of tomato sauce with ground beef on top of eggplant layer. Sprinkle 1/3 of mozzarella cheese on top of sauce layer. Repeat 2 more times, finishing with a layer of mozzarella cheese. Bake in the preheated oven until cheese is melted and sauce is bubbling, 10 to 15 minutes. Cool for 5 minutes before slicing. Layers of breaded roasted eggplant with ground beef, tomato sauce, and cheese. This was so good I made my own seasoned bread crumbs and added garlic and onions to the ground beef. This is a wonderful dish! And my family loves eggplant cooked this way so much that now I don't even bother putting the lasagna together - they eat the eggplant up before I can assemble!! !